My goondess you do get up early there. It's only 8:39 am here on the right coast and you have already posted a photo for today. Do you get up with the chickens?? lol! Me too, but no chickens, only the neighbor's motorcycle with HUGE pipes. 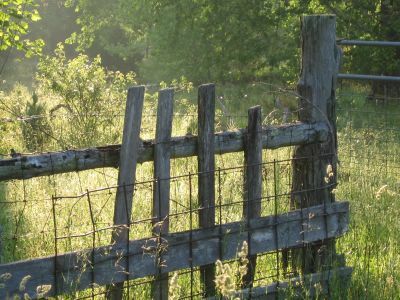 There's something quite attractive about your old fence. It seems like a very peaceful location. Reminds me of a place near to where I grew up, especially in the early morning sun. I know you're really busy, but you could probably do a line of greeting cards from your pics. I love the way you see "kodak opportunities". Again a beautiful picture. 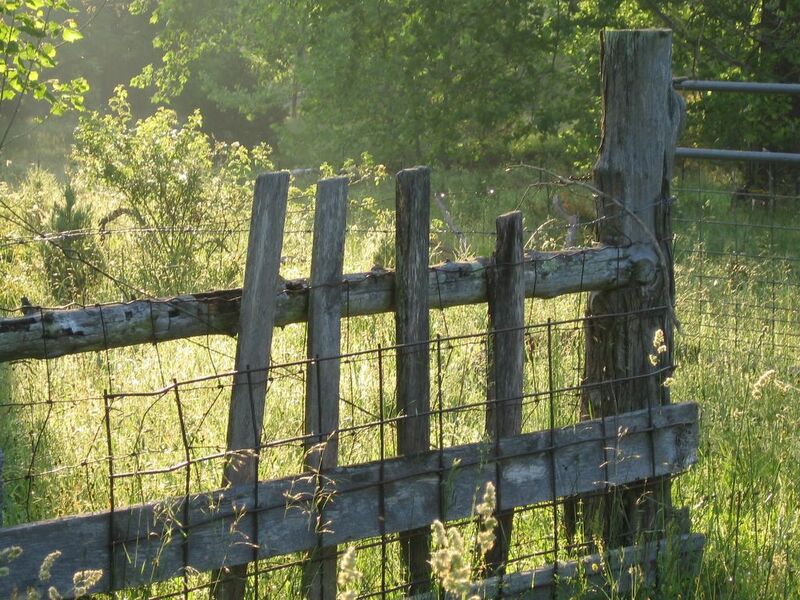 I have to admit I have a thing for ratty old fences. There is nothing like early morning sunlight for magically transforming something mundane into something special. Ah, the photo greeting card idea. Thank you--I'm flattered by your suggestion. This idea has been mentioned and kicked around various times since I started this blog, but I've (foolishly) never done anything with it yet. I'm busy, sure (who isn't? ), but I should definitely make time for something that might actually turn a profit, LOL! Unlike, you know, hugging sheep. Or even raising sheep! Thank you. I was thinking of you again today as Snugglebunny was walking through the grass and literally tripping over her twins. I don't know how you all do it. Thank you. Yes, must investigate this greeting card idea further this time. The greens and pale yellows are so nice in that photo! For the life of me... I keep getting something more like a sweet yeasty biscuit. Still very nice and yummy - but not what I was aiming for. Any advice? I just came upon your site, and I have bookmarked it and your offshoots in gardening and food - two of my favorites as well. You take beautiful photos and you were very brave to make such an exciting change in your life. As far as I am concerned there is nothing better than having land, and sharing it with fauna and flora! Good luck, I will keep visiting. I'm flattered that you came to me with your dinner roll question. Unfortunately I can't off the top of my head think of a recipe that will give you the results you are looking for, esp. as I don't know what kinds of recipes you're using right now that are giving you the biscuit type rolls. I would try checking out The Fresh Loaf site. They have all kinds of recipes and baking lessons and information, plus forums where you can ask for help. Good luck, and I'd love to know if you find the perfect recipe, as now I want some of the rolls you're describing!